Giant Freshwater Stingray Fishing in Thailand at the Ban Pakong River for the awesome (Himantura Chaophraya) is possibly one of the last frontiers of truly pioneering freshwater fishing in the world. 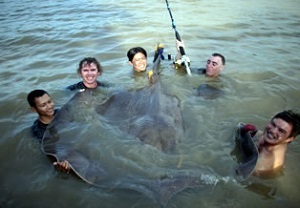 Anglers from around the world are drawn to Thailand fishing for the Giant freshwater stingrays which are found in the wildest and largest tidal rivers of Thailand.The prehistoric Giant stingray in Thailand has been widely described as the world’s largest freshwater fish and is a fish shrouded in many myths and legends. 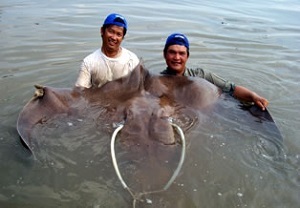 The Fishsiam team in Thailand has pioneered modern catch and release fishing methods for this particular species in the rivers of Thailand and has successfully captured in the excess of four hundred different stingrays to a world record breaking estimated 350 kg’s whilst stingray fishing at several tidal rivers in Thailand. Anglers in Thailand fishing for stingrays at this mighty tidal river will be fishing against a stunning back drop of ancient gold encrusted Buddhist temples and rustic local riverside markets with vendors supplying every sort of food imaginable in addition to local textiles and various other weird and wonderful items. The sleepy riverside town of Chachoengsao which nestles on the banks of the mighty tidal river is the starting point for all of our fishing holidays at the Bang Pakong River and has featured in several National Geographic TV productions with Dr.Zeb Hogan concerning Giant stingrays. Chachoengsao town is situated a short distance from the city of Bangkok and the town is visited by tourists in relatively small numbers allowing it to retain its charming rustic appeal as a perfect example of an urban riverside fishing community in Thailand.Old weathered shop fronts and makeshift road side restaurants line the labyrinth of interconnecting streets which are littered with a myriad of food stalls selling a wide variety of exotic local delicacies which fill the air with a spicy and pungent mix of aromatic smells and flavours.The town of Chachoengsao is an extremely old riverside community built along the banks of the river dating back to ancient times and still has the decaying remnants of an old fortress wall dating back to the opium wars.Commercial fishing is a massive local industry in Chachoengsao with both small scale and larger sized industrial fishing operations based in the area which contribute greatly to the local economy and community.The Bang Pakong river is bordered on one of its banks by the town of Chachoengsao with the riverside lined with a mixture of floating restaurants and stilted wooden huts which serve as dwellings for the local fishermen and their families.The opposite bank is bordered by rich and fertile fruit plantations and a much more rural and scenic landscape of lush paddy fields. Anglers choosing our daily and weekly Stingray Fishing holidays and tours at the Bang Pakong River in Thailand will be based on the riverside in certain locations or alternatively from boats crewed by our highly experienced angling guides in their search for the largest freshwater fish in the world. When angling in Thailand for Giant stingrays, clients will be transported to various areas of the Bang Pakong river which have previously produced monster fish to our clients to well over 200kg’s. Anglers fishing for stingrays at the Bang Pakong river will be fishing in the same record breaking stretch which produced several monster stingrays to an estimated 200 kg’s whilst recently filming with Dr.Zeb Hogan from the National Geographic Society. Battles when Giant Freshwater Stingray Fishing are generally measured in hours not minutes sometimes requiring several anglers to take turns to fight the stingrays.The Fishsiam team and our clients have experienced numerous epic battles with Giant Whiprays in the past with some battles lasting in the excess of an arm aching six hours! When choosing one of our stingray packages, clients will be assisted by a highly experienced 4-5 man team of guides angling from a large fishing boat in addition to having an additional smaller support boat for bait placement and support. Only the strongest big game equipment can be used at this location, with 80-120 lb class stand up rods (Okuma) fitted with roller guides coupled with two speed multipliers and heavy braided mainlines and 9/0-10/0 Owner circle hooks. Battles with this species commonly last for several hours requiring a gimble in addition to fighting harness to bring these monster fish to the boat! 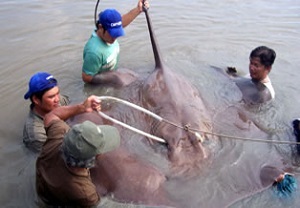 Giant Freshwater Stingray Fishing at the Ban Pakong river is seasonally dictated by weather and water conditions causing the river to become unfishable at certain times of the year.The Ban Pakong is influenced by tidal influxes from the nearby Gulf of Thailand which see water levels fluctuating dramatically through the course of the day.At low tide time vast swathes of bank are exposed above the water revealing deep mud banks along its wide and imposing length. Big Giant freshwater stingrays can be caught regularly whilst fishing at the Bang Pakong river during a large part of the year with the months between November (end of Thailand’s raining season) and April generally being the most productive season for catching larger sized rays.During our many angling expeditions we have found full moon lunar phases to be the most productive times to fish for these giants, generally allowing the best water conditions and longest tides in which to target the bigger specimens. Due to the lack of scientific information and the huge amount of scientific interest surrounding this species we are regularly joined by official veterinary scientists who regularly examine the rays before release after being caught by our clients.The aquatic scientists may perform DNA sampling, tissue sampling, toxicology tests in addition to a variety of other fascinating scientific procedures concerned with the study of Giant freshwater stingrays in the rivers of Thailand. For More Information on Fishing for Gianf Freshwater Stingray please Contact Us using the button below.